So, here I am a few weeks after graduating from college and I am still looking for places to work. I have applied to many places including preschools, after school care, translators, etc. Can I just say applying for jobs can be tiring! I mean some of these applications take me up to an hour to finish. They require me to write my experiences, past jobs, volunteer work, etc but they also want me to include my resume…wait…what? Everything they make me write is on my resume. I really don’t understand why they make me write it down, when I am already attaching my resume. Anyway, so that takes time. Then they usually have questions regarding the job such, “what would you do if…” or questions to understand my personality and work ethic. It can be tiring, especially when applying to so many different places. I have had a few phone interviews, as well as an interview in person. It can be a bit nerve-wracking and stressful. Some places say they are very interested, but the waiting is hard. My fear is that more than one place will end up wanting to hire me, and I won’t know which one to take. That is where prayer will come in to help me decide…that is if a place actually wants me. The one good thing is that I am bilingual. I speak both English and Spanish. And then of course there is my other fear…that I won’t find a job. I know that I want to be a stay at home when I have children, however it would be nice to have a job to save money for when I do get married. When you first get married you are usually tight on money and so every penny I can save now will help. Other than the search for a job, I have been trying to meet some new people. Most of my friends are now married or still at school or have moved to different places. I have been going to a different building for church to meet new people. If you didn’t know already I go The Church of Jesus Christ of Latter Day Saints. They have a time for people who are single to meet and go to church. That is where I go. I am attending the one in Huntington Beach. I have talked to a few people there, but I haven’t made any close friends yet. Hopefully as I continue to go I will meet new people so that I will actually have things to do during the week…especially if I don’t find a job soon. Haha. They look super cute right? I don’t really know how to sew, but I want to learn. I did finish my first sewing project though. I made a blanket for my niece. I think I did a pretty good job. When I made it we didn’t know what the gender would be yet, so I did blues because that can be okay for a girl too. We now found out that my sister is having a girl. The back is just a light grey color. 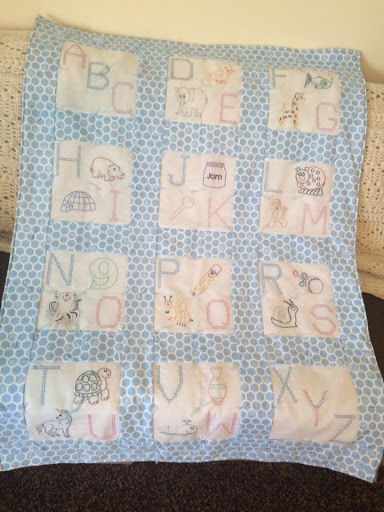 I cross stitched each picture, and then sewed the polka dot strips to the squares, put in the batting, sewed the back to it and tied on those little light blue strings. What do you think? Did I do okay for my first sewing project?